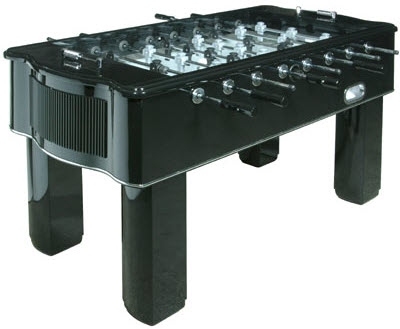 The Piano Black foosball table, model number #50151 from Halex, is a remarkable looking table that is like no other. This table's design would match great if you happen to have a piano in your game room. The glossy black finish provides a luxurious style that is sure to impress your guests. The Piano Black does have some limitations in terms of competition style parts that can be found on the Tornado foosball tables. The rods on this table are heavy and sluggish and the robot style foosball men do not offer the ball control to shot complex foosball shots. This foosball table is priced at around $450 US.